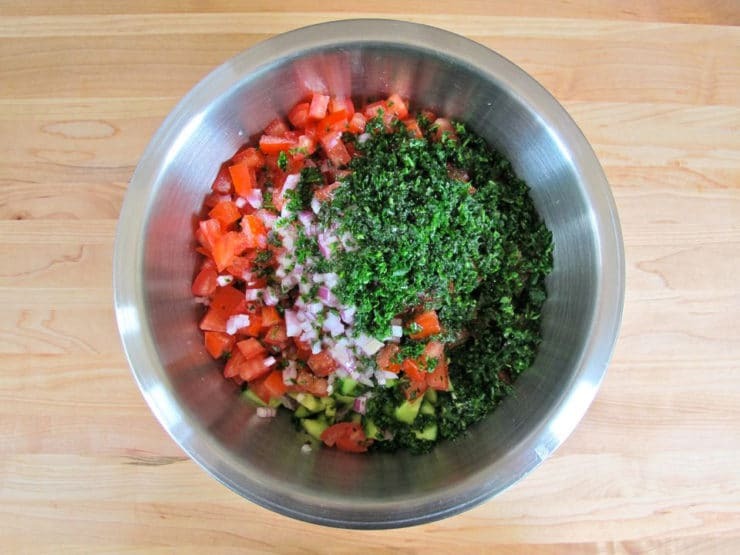 This week I want to introduce you to Israeli Salad, a dish that is ever-present in my kitchen. It’s easy to make, inexpensive, and surprisingly delicious. In summer, I serve it alongside grilled fish or kebabs. In colder weather, I use it as a healthy side to lighten up heavy meals. I also serve it with breakfast sometimes, it goes great with an herby egg and cheese omelette! For those of you who aren’t familiar with Israeli Salad, here’s a little background. 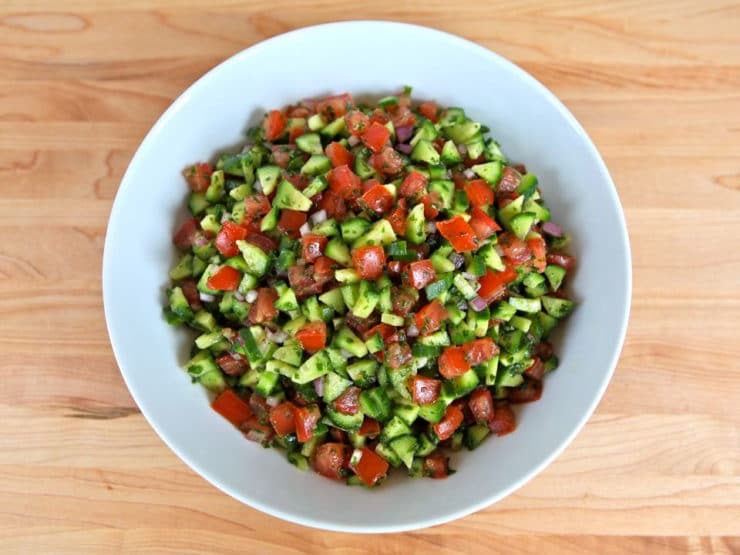 It evolved from a Turkish salad known as shepherd’s salad – coban salatsi, which is closely related to a Persian salad known as salad shirazi, named for the ancient city of Shiraz. The salad is known under different names with slight ingredient variations throughout the Middle East. When Jews began making aliyah to Israel in the late 1800′s, coban salatsi from Israel’s Turkish neighbors became popular on the kibbutzim (communal agricultural collectives) because of the simple, easy-to-grow ingredients– cucumbers, tomatoes, onions, peppers, and parsley. Over time, ingredients were added or taken away, but the basic components remained the same: cucumbers and tomatoes dressed in olive oil, lemon juice, and salt. The vegetables are always diced; the size of the pieces varies depending on personal preference. Some cooks prefer to dice the vegetables very small, a practice that started in the Ottoman Empire. Other cooks prefer a more chunky texture. I like it both ways. Though this salad has different names throughout the Middle East, my family refers to it as Israeli salad because of my husband’s Sephardic background. It is a refreshing side dish that complements all kinds of main dishes. It is low in calories, dairy-free, and can be served with any meal– even breakfast! Each ingredient in the salad has unique health benefits. Fresh Persian cucumbers (peel on) are fat-free, full of water, and a good source of fiber. Fresh tomatoes provide Vitamin C, A, and cancer fighting lycopene (organic tomatoes provide up to three times the lycopene of non-organic!). Onions are rich in chromium, a trace mineral that helps cells respond appropriately to insulin. Onions can lower blood sugar levels, and they’ve also been shown to help lower cholesterol and blood pressure. Fresh parsley is a great source of Vitamin K. It also contains Vitamins C and A, Folate, and anti-oxidants. Lemon juice is full of Vitamin C, antioxidants, and potassium. It’s also a natural diuretic. Olive oil provides a healthy dose of MUFA’s (mono unsaturated fatty acids) and can help with digestion. Unfortunately, some grocery stores only carry Persian cucumbers seasonally, and some don’t carry them at all. If you can’t find Persian cucumbers, you may substitute English cucumbers—those are the long thin ones wrapped tightly in plastic. 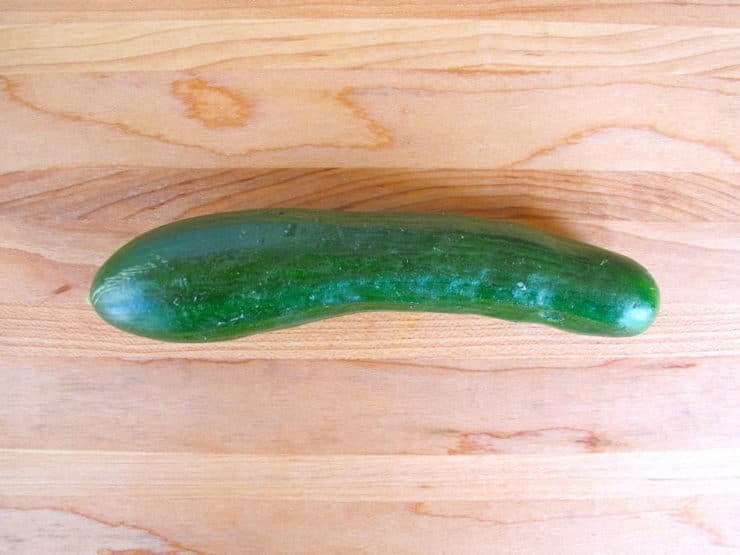 Avoid using regular fat cucumbers, as they are coated with wax and prone to bitterness. Persian cucumbers have lots of little seeds, which add to their flavor. 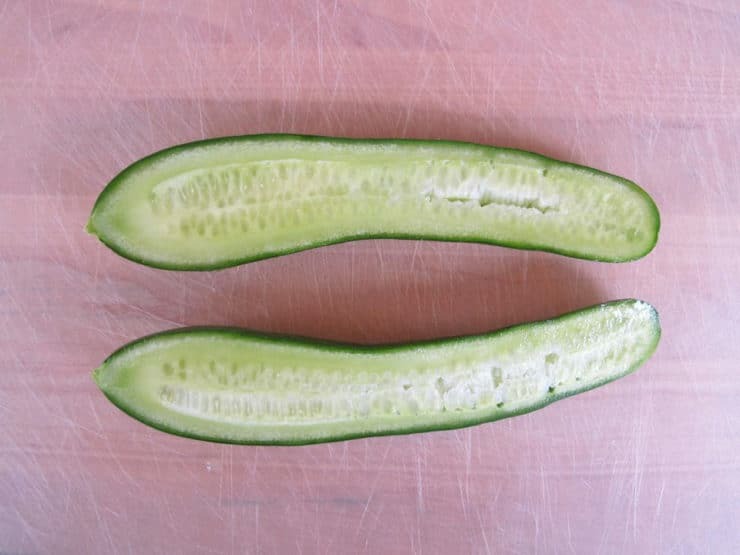 If you have trouble digesting seeds, you can seed the cucumber easily by slicing it in half lengthwise and scooping out the seed-filled center. This week, I’ll be giving you some of my creative variations on Israeli Salad. I try to use seasonal produce in my cooking, and I often experiment with whatever looks freshest in the vegetable section or at the farmer’s market. Adding seasonal or regional ingredients can really “spice up” your Israeli Salad. 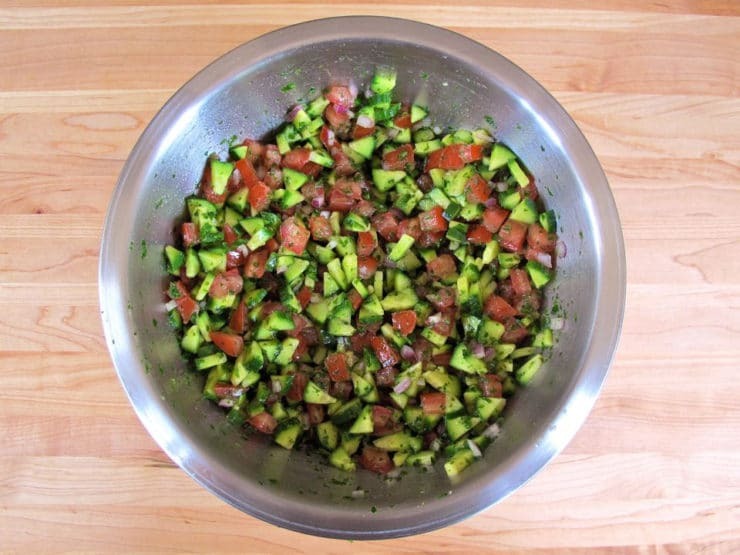 Before I get into variations, here’s a recipe for a simple Israeli Salad. I don’t like raw onion, so I often make mine without. Our family enjoys it both ways. Be sure to dice the vegetables small and evenly– I’ve given my tips for slicing Persian cucumbers below. To learn more about the history of modern Israeli salad, click here. Here is the way I like to dice the Persian cucumbers-- it produces small, even, triangular pieces. 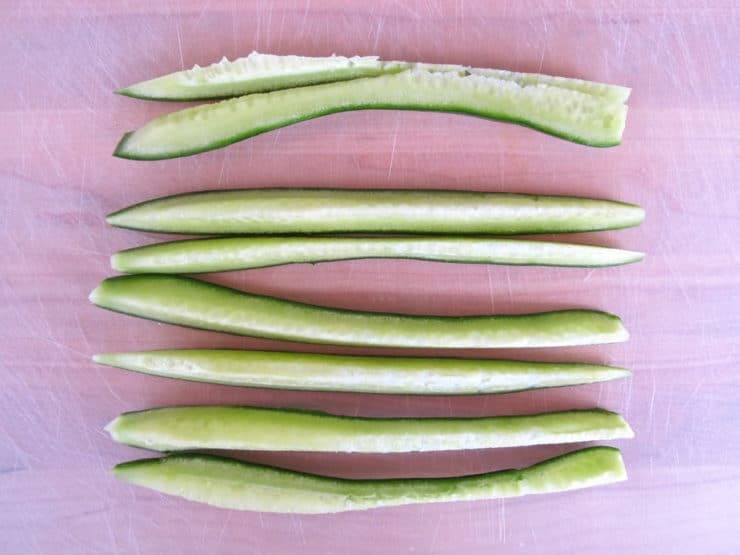 Slice the Persian cucumber in half lengthwise. Slice each half into 4 slices lengthwise, so you have 8 long, thin pieces total. Hold the long, thin pieces together with one hand, and slice the bunch into very small pieces with the other hand. Place the diced cucumbers into a large mixing bowl along with all the other ingredients. Mix till vegetables are well coated with parsley, oil, lemon juice, and salt. Best served fresh at room temperature. You can also serve chilled for a more refreshing salad. Thank you for sharing this amazing recipe. I notice that there is some kind of white dressing. By any chance would you know, what the dressing is? It taste middle eastern. Thanks! I had a favorite hole-in-the-wall restaurant that served this salad as a side. I haven’t found a similar restaurant since moving, so decided to try your recipe. Delicious, thank you! And my contractor is Israeli so I mentioned the salad. He happily described making it exactly as you do, and he likes a little tahini on top. Until I find another chicken schwarma place, I love it with cottage cheese. Recently returned to our home in Traverse City, Michigan from a Holy Land trip. This salad was served to us regularly. Glad to have this recipe so My husband & I can have a tasty reminder of our wonderful trip. Does matter what type of onion is used????? And can you throw in a diced jalapeño pepper!!! Add chopped dycon, chopped carrots, red and green bell peppers, NO OIL, shred some blue cheese ( 2 oz.) and you have a full meal – 2 full cups. Can use Tachini as a dressing, Eggplant (BABA GANUSH) . Fro BABA GANUSH Mash (Grind) Japanese eggplant, fire roasted with some of the burnt skin, add fire roasted red bell pepper, Lemon juice, Tachini, salt pepper, now enjoy. I had this salad several times on a recent trip to Israel and the Middle East. I am so glad to find a recipe so I can make it at home. I think I at more of this salad than anything else! I LOVE IT!!! I first saw it on Rachael Rays show on TV, but googled it on internet and chose yours. Yours was most definite, and I like the story that went with it. Also, you really gave the recipe, complete. I only made it with tomatoes, cucumbers, and raw onion, but I see you also put peppers, fresh parsley, and dress it with olive oil and lemon. I only had lemon on mine, and no olive oil or parsley. I will try, next time to have ALL the ingredients available. Thank- you, I love to try good, interesting, and simple recipes. You’re welcome, Carol! There are so many ways to make this salad, and lots of fun variations to try like cubed avocado and mint. Glad you enjoyed it! I was recently in Israel and have never encountered such wonderful vegetables, watermelon, apricots, and other various fruits. I’m thrilled to meet you on line. This will add to my Chanukah celebration table. If using English cucumbers, should they be deseeded? Hi, Tori’s assistant Ashley here. It’s really a matter of personal preference, but I would probably remove the seeds if there are a lot of them. 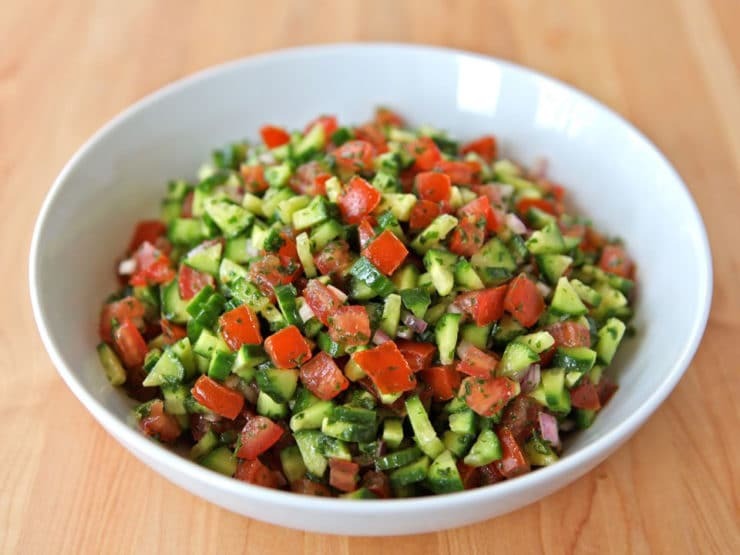 We love this salad and are using cucumbers and tomatoes from our garden. Thanks for sharing! Just like the salads we had in Israel! So good! Thank you for sharing this recipe. What type of tomato do you prefer to use? Hi Jill, Tori’s assistant Ashley here. Heirloom tomatoes are always nice, but any ripe tomato will do. I made this several years ago and loved it. I’m wanting to start eating healthy again and remembered Israeli salad, so I wanted to check the recipe. Yours recipe sounds like what I made before. Thank! I do remember rreading something about not adding the salt until you’re ready to serve it. Is that true? Also what would happen if I decide not to seed the English cucumbers or Roma tomatoes? I’m looking forward to checking out your other recipes! Hi Cristal, salt can draw out the liquid from the vegetables which can render the dish soggy, so yes. Also, if you don’t seed the vegetables it will add some liquid to the salad, which can also make it soggy. Not a problem if you’re serving right away, but if making ahead it’s best to seed the tomatoes at least to keep the salad crunchy. Could I make this 24 hours in advance, by chance? Yes, however for best flavor I would toss it with the dressing just before serving (rather than letting it sit in the dressing, as it can become somewhat mushy). There are many variations. We don’t put parsley because it’s too dominant. It’s recommended to eat it with Gvina levana, or Israeli white cheese, which is a little like a very low fat cream cheese mixed with the German Quark cheese. Does mint go well in this salad ? This salad is, in a word, awesome! Made it exactly as written and it tasted great! Thanks for posting! I can’t wait to make it for thanksgiving day , my family will love it ! looks so delicious and very healthy . I don’t put the tomatoes in until ready to serve as they do get mushy if left inside. I also dice up green and red bell peppers and scallion or radish. excellent! A matter of fact if you don’t put in the tomatoes , the next day its even better cause the juice of the lemon and olive oil give even more flavor. If you add burgul it turns into another famous Palestinian dish called taboulieh. Lovely! I have never had this problem before but this year I have English cucumbers coming out the yaya in the garden… this is a great recipe for me to to take to a potluck on Sabbath! Thank you! I absolutely love your version of this traditional salad. Excellent, cannot wait to give it a try. Our grocery store just had this as a new item in the deli tonight for a whopping $7 a lb!!! SO, I bought cucumbers and tomatoes so I could make my own!!! Found your site just to make sure I was doing it right, and so glad I did. I did change it a little though … I used salt, pepper, garlic powder, and parsley, with Robusto Italian Dressing! DELICIOUS!!! Such a refreshing, yet healthy salad that could easily be a meal!!! Tori, Thanks for this! It has become a staple in my kitchen as well. Your proportions are perfect. I do confess to adding red bell pepper and sometimes lemon/lime juice mix, depending on what I have, but this is a bright, refreshing, mega healthy nosh at any time of day! I love this salad so much. Your recipe is lovely (as is your site). I hope you don’t mind that I recommended your recipe on our blog! I just returned from Israel and love the salads that are available for breakfast! This chopped salad one is everywhere, and served with any and all meals. It is part of the street food culture and added to falafels. Your version is closest to the ones I ate, and I will also try the variations posted here. Will be making this for our evening meal but will try soaking the diced red onion in the lime juice for a couple of hours prior to mixing it in with the rest of the ingredients. We do this when making another salad with watermelon and feta and it makes the onion milder/sweeter and easier to digest. This is the first time I have heard of soaking red onions to make them milder. I love onions I definitely will give this method a try. Thank you. I realy like this salad. I hope my friends try it. You will make it over and over again. Two excellent ingredients you could incorporate is a diced ( very small ) cabbage and chopped green olives. Sometimes it is also nice to throw in a diced green pepper. But the best of the three is the cabbage. I have eaten many variations of this salad over the years and loved each one. Gods like this just make you feel good. Thanks for sharing your recipes. This salad was amazing. It got even better after it sat in the fridge for a few hours. I could eat the whole batch by myself. This is a new favorite that I will be serving over and over again. Shalom Tori im going to Israel soon and i wanted to know the dishes thank you for sharing with me . I’m a salad lover I’m making one today. This is a staple in my life. I was just looking at the recipe again, to send the link to my nephew, as he asked for the recipe after I made it for him. Then I saw the ratings. I can’t believe anyone would rate this less than 5 stars! 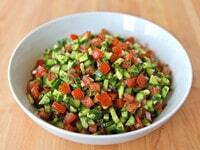 Looks sooo much like Fattoush to me! THAT doesn’t look like fattoush, trust me, i know fattoush and THAT looks NOTHING like fattoush salad. My sister in NZ emailed that she was making chicken schnitzel – wondered what this was saw your blog and realised I had made this before but not called it schnitzel so I am doing this tonight but this time with your mouth watering salad, I am in my 80’s so never too late to live and learn ! I am not a big fan of “lettuce” salads so this caught my eye. I mixed some up this morning…it is an hour later and I am enjoying this salad, a scoop of hummus and a soft boiled egg. I’m in Northwest Montana but a local hydroponic garden supplies mini-English cucumbers and grape tomatoes year round so I used those. I’m sure it will be even better this summer with fresh heirloom tomatoes. And I can see adding some kalmata olives and feta and taking it “Greek”. So good – Thank you, Tori! While in Israel I had this salad where they had also sliced/diced lemons in the salad, the rind was left on the lemon. As a lemon lover I went crazy over this. LOVE your blog. Great simple salad… love the colors very refreshing. Making Isreali salad now and wanted to be sure I was doing the right thing. Thank you! So yummy! Husband and I tried this in Israel and loved it, came back and came to your website first thing to see if you had a recipe. Of course you did, and it tastes just like the one we ate in Israel every morning at the breakfast buffet. Thank you! I really enjoyed the Sephardic Israeli Salad. In the past I have used red wine vinegar, but the lemon is really nice and fresh tasting. I am now making your Persian lamb stew. Thank you so much for posting these great recipes. Sarah, just saw this post. Glad I could help! Lime juice and oregano sound like terrific options, I will have to try them soon. What an interesting background your boyfriend has… Cuban and Sephardic Jewish… bet he has some amazing recipes! I am also a proud Shiksa and I have been dating a Sephardic man who also happens to be Cuban since January. He loves to cook and I’m sure you can imagine the wonderful culinary delights I have been privileged to enjoy in the last few months! He loves to make a salad that is very similar to this and I love it. He puts in oregano instead of parsley and uses lime instead of lemon. He also adds cilantro and salt, which gives it a wonderfully Latin flavor. Thank you for posting this…I now know the secret to “the salad”. In the Persian community, we call this “salad-e-shirazi.” The cucumbers are always peeled and seeded. The tomatoes are quartered and seeded. Red onion is preferred. Parsley and mint. Pepper, salt, lemon juice (although lime juice is much better) and not too much olive oil. Add dressing and allow to marinate in the frig for several hours. Then serve. The key to this Persian salad are the itsy bitsy teeny tiny dice of cucumber, tomato and minced red onion. The smaller the better is the rule of thumb. Tip for the cucumbers. Peel, cut in quarters the long way, scrape down to remove seeds. Turn the piece over and slice each quarter into thin length-wise slices, and then into really extra small dice cross-wise. For the tomatoes, after draining on paper towel, turn inside down on a cutting board and slice into thin strips in one direction, and then into extra small dice crosswise. Onion should be minced. Herbs should be washed, stems removed and leaves chopped very fine. Each spoon of salad should be filled with a colorful mosaic of tiny (the smaller the better!) dice of green cucumber, red tomato, pink onion and green herb. The major point to remember is that no matter how much you make, you’ll never have enough! If any happens to be left over – I make massive quantities – my husband eats it with breakfast. A small batch in our house runs to about 10 large-ish cucumbers, 10 tomatoes, a small red onion, and lots of parsley and mint. 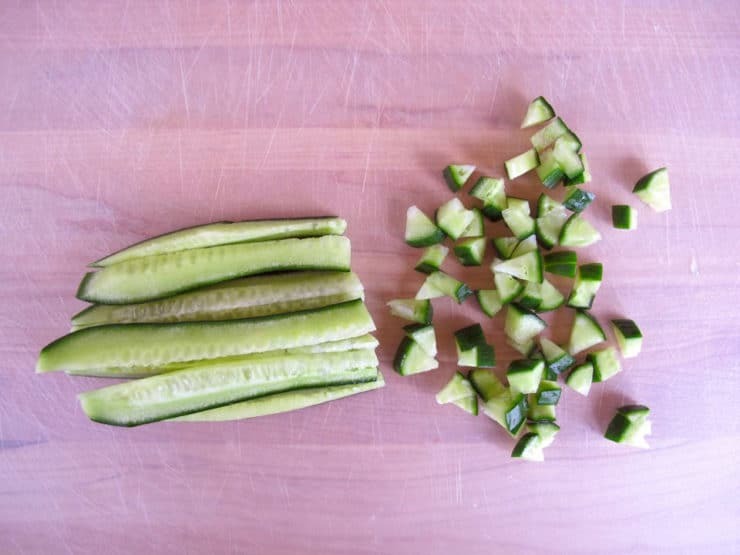 Another one I make is Hungarian in origin, Sweet and Sour Cucumber Salad: 10 large cucumbers, peel, cut in quarters, seed, slice into four strips lengthwise and then into crosswise thin-ish slices. Mix with 1 TB of kosher coarse salt and place in colander to drain for about an hour. Meanwhile, heat up a cup of good white wine vinegar with one cup of sugar, along with a few whole peeled sliced garlic cloves. Let cool. Rinse cucumbers well to remove salt. Remove as much water as possible. Mix cucumber slices with dressing and refrigerate. Much better the next day. Very refreshing and quick to put together. Very interesting, Schelly. The Hungarian variation sounds intriguing!